Alice Villalobos, DVM, DPNAP, a renowned veterinary oncologist, introduced “Pawspice”, a quality of life program for terminally ill pets. Pawspice starts at diagnosis and includes symptom management, gentle standard care and transitions into hospice as the pet nears death. Dr. Villalobos developed a scoring system to help family members and veterinary teams assess a pet’s life quality, The HHHHHMM Quality of Life Scale. The five H’s stand for: Hurt, Hunger, Hydration, Hygiene and Happiness. The two M’s stand for Mobility and More good days than bad. The QoL scale is also a helpful decision making tool to assist pet lovers in the difficult process of making the final call for the gift of euthanasia to provide a peaceful and painless passing for their beloved pet. Available for download at http://www.pawspice.com. For the purposes of this page, Dr. Villalobos suggested her feline scale, rather than her canine scale, as more applicable to rats. Dr. Pilny's thoughts on euthanasia: Euthanizing a Pet Rat: A Veterinarian's Advice on Deciding If and When. Lindsay Pulman's summary of The Medical Procedure for Compassionate Euthanasia of Pet Rats. Feline caregivers can use this scale to evaluate the success of their Pawspice program. Grading each criterion using a scale of 0 to 10 (10 being ideal) will help caregivers determine Quality of Life for sick cats. Cats - Adequate pain control, including breathing ability, is the first, and foremost consideration. Is the cat's pain successfully managed? Is Oxygen necessary? Cats: Is the cat eating enough? Does hand feeding help? Does the patient require a feeding tube? Cats: Is the patient dehydrated? For cats not drinking or eating foods containing enough water, use subcutaneous fluids once or twice daily to supplement fluid intake. Cats: The patient should be kept brushed and cleaned. This is paramount for cats with oral cancer. Check the body for soiling after elimination. Avoid pressure sores and keep all wounds clean. Cats: Does the cat express joy and interest? Is the cat responsive to things around him (family, toys, etc)? Does the cat purr when scratched or petted? Is the cat depressed, lonely, anxious, bored, afraid? Can the cat's bed be be near the kitchen and moved near family activities so as not to be isolated? Cats: Can the cat get up without help? Is the cat having seizures or stumbling? Some caregivers feel euthanasia is preferable to a definitive surgery, yet cats are resilient. Cats with limited mobility may still be alert and responsive and can have a good quality of life if the family is committed to providing quality care. Cats: When bad days outnumber good days, quality of life for the dying cat might be too compromised. When a healthy human-animal bond is no longer possible, caregivers must be made aware that their duty is to protect their cat from pain by making the final call for euthanasia. The decision needs to be made if the cat has unresponsive suffering. If death comes peacefully and painlessly at home, that is okay. A total score over 35 points represents acceptable life quality to continue with a good Feline Pawspice. SOURCE: Thank you, Dr. Villalobos: Original concept, Oncology Outlook, by Dr. Alice Villalobos, Quality of Life Scale Helps Make Final Call, VPN, 09/2004; scale format created for author's book, Canine and Feline Geriatric Oncology: Honoring the Human-Animal Bond, Blackwell Publishing, 2007. Revised for the International Veterinary Association of Pain Management (IVAPM) 2011 Palliative Care and Hospice Guidelines. Reprinted with permission from Dr. Alice Villalobos. 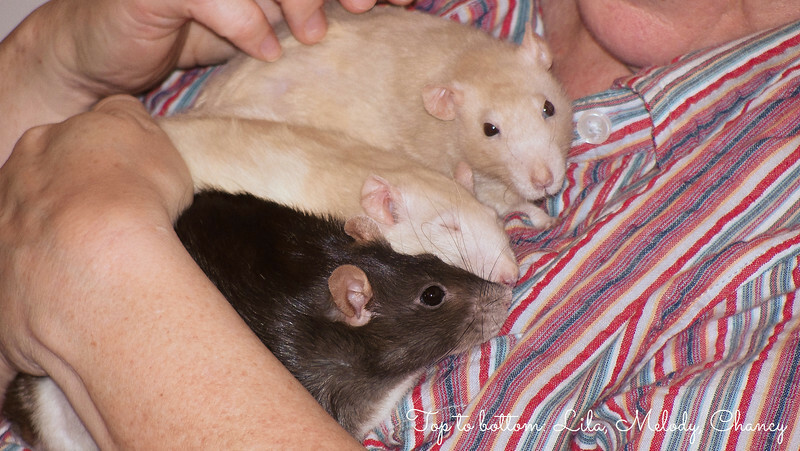 From top to bottom: Lila, Melody, and Chancy ("Chance-ee"), November 2010, about a month before Lila and Melody had to be euthanized due to complications from cancer. Chancy, at 3 years 7 months, had another 8 months with me. After Lila and Melody died, I was able to introduce Chancy to 2 young boy rats, with whom she became friends until the end. Chancy was euthanized in July 2011, at age 4 years 3 months, because a benign tumor had grown large enough to affect her quality of life.